JVC's DLA-X55R is a brand new 1080p home theater projector featuring their "4K e-shift2" technology. 4K, or 3840x2160, is a high-resolution video format with four times the pixels of 1080p. And while the X55 is not a native 4K projector, their e-shift lays claim to 4K levels of quality. Built with home theater in mind, the X55 is a videophile's dream. JVC's home theater projectors have always had excellent black level performance, but the X55 takes this to a new level. Without the assistance of an automatic iris, the X55 manages the deepest blacks of any home theater projector under $5,000 we have seen to date. Flexible lensing, powered adjustments, and a whole slew of convenient home theater features make the X55 a great cinema projector for someone willing to take the time and set things up properly. The X55 is not for everyone. These days, many people want the ability to use their projectors in rooms where light control is less than perfect. While many other home theater projectors give users the kind of flexibility needed for this multi-purpose use, the X55 is not one of those projectors. But if you have the space and the will to make it work, the X55 can be an excellent projector for serious home theater. The fact that the X55 is built for home theater becomes clear as soon as you turn it on. For a few moments, there's nothing, just blackness, before a brilliant white JVC logo springs to life in the middle of the screen. That's when you realize that the projector is already warmed up, and black level is really just that good. The X55 has a 2.0:1 zoom lens with vertical and horizontal lens shift, and all of the adjustments are powered. That makes it a good candidate for rear shelf placement although most users will probably opt for ceiling mount due to its size. Rear shelf placement has the advantages of being easy to set up and not requiring any additional mounting hardware other than a shelf. The X55 can display a 100" diagonal 16:9 image anywhere between 10' 2" and 20' 4", depending on how you set the zoom lens. That's a lot of leeway. It also means you can get a decently large image up on the screen in almost any room, from a tiny converted bedroom to a full-sized dedicated theater. The X55 has excellent black levels and very good contrast, but those are not the only reasons to work on your room's ambient light control. While the X55 is rated at 1200 lumens maximum, its calibrated Cinema mode puts out about 550 lumens with the lamp at low power, and that number can go as low as 380 lumens at the telephoto end of the zoom lens. As such, having a room with no ambient or reflected light is ideal. Aside from turning off the lights, it is also a good idea to cover any reflective surfaces with dark-colored, non-reflective coatings. To make a long story short, while the X55 is a wonderful projector in the right room, it is not for everyone. Even a little bit of ambient or reflected light can have a major effect on black levels, and anyone considering a purchase should prepare the theater room to take full advantage of the projector's performance. After all, you're paying a premium for it. In a dark theater room, the best screen material for the X55 is low gain white. A screen gain of about 1.3 will reduce light scatter without creating hot spots. And with a projector this high in contrast, there's no need for a contrast-boosting gray screen. Hey Mike, So I've gotta ask the $1M question...how does it stack up against the Sony VW-50es. GIVE ME A BREAK. 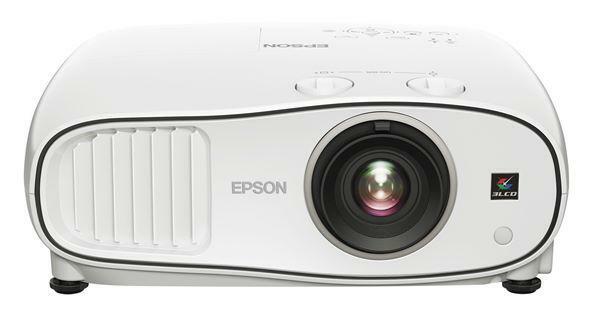 The Epson projectors have the most inconsistent performance of all the big projector companies. In fact every unit I received 8500, 8700 or 9700 all had some significant flaw. The new 5020 after you perform panel alignment would be considered a joke after looking at JVC X55R or the Sony VPL-HE50ES. Also black and white movies exhibit poor uniformity on left and right sides of the screen with green and red tinting on a black and white movie, its very obvious ( but then again you guys never look at black and white material ) The other projectors listed do not experience anywhere near the inconsistencies of the Epson. Projector Central use to be far more objective. GIVE ME A BREAK the 5020 is no where near the same class of projector as the JVC X55, SONY VPL-HW50ES or Panasonic 8000. simply because of their poor quality control. Most Epson owners have a minimum of 3 returns. Don't waste your time on EPSON unless you got a lot of time to waste. Nice review. You also reviewed the Sony VPL-hw50es, how does it compare to the JVC since both are LCOS projectors. Since the Sony VPL-hw50es uses LCOS technology like the JVC, shouldn't you have used the Sony to compare against the JVC? Bill, you reviewed both JVC and Sony so I'm a little curious why you chose to compare the Panasonic and Epson instead. I see a lot of people are wondering why we didn't compare the JVC X55 to the Sony HW50 we reviewed back in March. The simple answer is that we returned our sample of the HW50 shortly after completing the review, so we did not have both projectors in-house at the same time. When writing a shootout piece, we need to actually see both projectors side-by-side on the same screen. And yes, we could compare the two projectors on things like features, or our measurements, but that's something that any reader could do simply by reading both reviews. While we could write up a shootout based on our recollections and notes, we see a lot of projectors over the course of a few months and the human memory is a fragile thing that's often wrong. So, instead of not writing a shootout, we chose to compare the X55 to two projectors we did have in-house -- the AE8000 and 5020UB. The AE8000 comparison is particularly useful since we also shot it out against the HW50, and now our readers can look at both projectors compared to the same baseline. The real value of a shootout piece comes from the insights we gain from actually shooting out the two projectors, side by side, in the lab. When we stop insisting on that, the quality of our articles as a whole suffers. I would have loved to do the X55 vs HW50 shootout, but the timing just didn't line up. I apologize for not being clear about the reasoning up front. Bill, I was set on the X55 until I read your comment about how it's an over kill for a family room. I plan to only use the projector at night witht he lights off and the only ambient light in the room would be begie walls, white ceiling and white furniture, which now sounds like plenty.. If I get a 120" diagona StudioTek 130, would I have washed out blacks when viewing?? What would be a better projector if this is not the right one for my set up. Thank you! Hi.. for my situation. Fully light controlled room with dark grey walls and black roof and black carpet floor.. I should get a white screen with 1.3 gain ? I was wondering if i can hook a gaming system to the projector. or any projector. hey, I wanna know whats the minimum distance should we keep between projector and the screen. Is 12 feet enough for a good performance.? For those waiting to make the final decision and are waiting to hear some practical 'hands-on' experience, I dove in and purchased the JVC. As a collector of 35mm films and an avid video game player, the JVC has impressed me every step of the way. Even in the darkened theater scenario, it requires the viewing of the green power on LED on the projector itself, or the fan, to know the unit is on. Also, the 12' distance is more than enough distance for a theater room with this unit. The power lens shift, focus, and zoom with the five separate memory assignments make placement on a shelf that is off center a breeze and the unit works well with video games. The only negatives: Fan noise (when lamp on brightest setting), only two inputs (HDMI), and the requirements of a low light area to enjoy it.